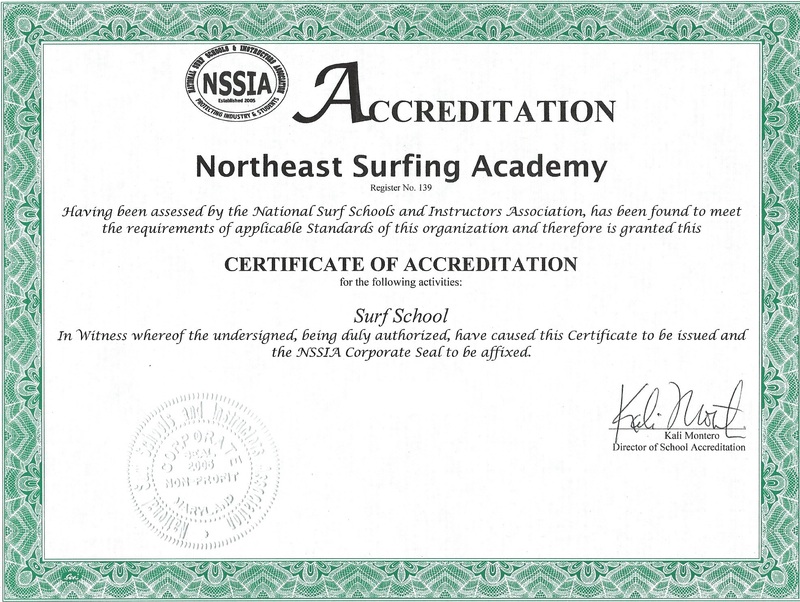 National Surf Schools and Instructors Association Certified. Monday to Friday Surfing every night with Certified Instructors. Accredited by the NSSIA we are an education based program. Our summer academy is all about fun activities, ocean and beach awareness, surf education, and of course surfing. Our academy surf instructors are all C.P.R. 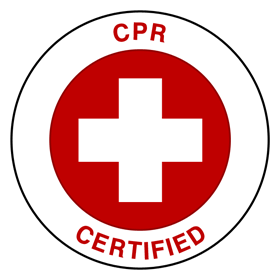 and First-Aid trained and ready to teach you the basics of surfing/paddleboarding and enjoying the ocean. 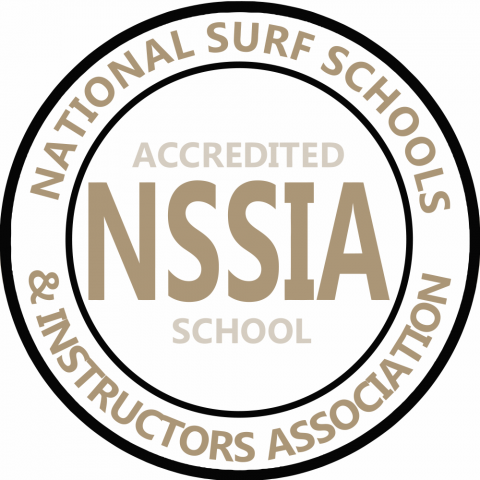 We only offer Certified NSSIA Surf Instructors. Whether you are a beginner or have some surfing experience, the small groups allow our surf instructors to provide you with the proper coaching. If you can't attend an entire week we also offer daily hour class lessons, click here. Our Surfing Academy: Our Surfing academy will help you enjoy and appreciate the ocean while experiencing the thrill of surfing. Northeast Surfing academies introduce ocean safety and surf etiquette, discuss ocean science topics such as waves and tides, marine biology, winds, coastal ecology and beach profiles, wetsuit education, surfboard education, teaches stretching and exercises for surfers and provides closely supervised instruction in the water. Everyone taking one of the surfing academy's should be strong swimmers, be comfortable in the surf area, and be able to tread water for a minimum of 1 minutes. Our Standup Paddleboard Academy: Our Paddleboarding academy will help you enjoy and appreciate the ocean while experiencing the thrill of paddleboarding. Northeast Surfing academies introduce ocean safety and paddleboard etiquette, wetsuit education, paddleboard education, discuss ocean science topics such as waves and tides, marine biology, winds, coastal ecology and beach profiles, teaches stretching and exercises for paddleboarders and provides closely supervised instruction in the water. Everyone taking one of the paddleboarding academy's should be strong swimmers, be comfortable in the surf area, and be able to tread water for a minimum of 1 minutes. All Academies’ come with a Northeast Surfing Academy T-shirt 4 days or more. Wetsuits: Included no additional cost. Duck Diving - Duck Diving is an efficient way of getting out of a breaking wave. It is similar to how ducks dive under the waves, hence the name. Learn how to duck dive in this section. Lining Up - Line up refers to the location where the wave breaks. In this section, know the ideal position in a line up and learn how to maintain order in an area where skilled surfers congregate. Learning where to sit on the wave, take off points, and more. Paddleboarding - We will teach you where to stand on the board, the different positions, terms, how to paddle correctly, turning, standing, prone, knee, weather, winds, and work on core balance. Gear - We talk about gear and how to choose a surfboard, all about wetsuits and more. Education - We will teach you all about surfing education, rip tides, weather, swell, tides, and more. Book your Week Academy Now, space is limited.